Yesterday ASTM put on hold its proposal to tighten up playground surfacing standards, according to reports from committee members. ASTM’s original proposal has prompted widespread criticism: most recently from campaigning journalist Lenore ‘Free Range Kids’ Skenazy and leading American playground design commentator Paige ‘Playscapes’ Johnson. So yesterday’s decision – to suspend publication and refer the issue back to the relevant committee – is good news. However, it is not clear what happens now. The next meeting of the surfacing committee is in May. But some members have told me that the chairman, George Sushinsky, is considering re-balloting members to push it through before then – perhaps before the end of March. [Update 11 March: I have heard via email that a re-ballot is indeed going ahead. The rest of this post has been lightly edited to reflect this fact.] This latest development is very worrying. I understand that the strength and depth of opposition to the proposal, and the degree of support for the wider review that many of us are calling for, were factors in yesterday’s positive decision. So for the chairman now to sidestep further proper debate even within his own committee is deeply troubling. I would urge anyone who supports the call for a wider review – from the USA and around the world, and both within and beyond the standard-setting process – to continue to make their views known publicly and to ASTM. The committee members I am in touch with have welcomed the public debate, and would I am sure appreciate supportive action. This is a complex issue with strongly-held views. I will continue to foster reasoned, constructive debate and share news and views, here and elsewhere, to the best of my ability – though there are challenges, not least the lack of transparency in ASTM’s decision-making. To repeat: there is no doubt that the extent of debate and opposition to ASTM’s proposal has helped to get this result. I am hugely grateful to everyone who has taken up the issue so far. I am sure that, in saying this, I speak for UK Play Safety Forum chairman Robin Sutcliffe (co-author of our letter to ASTM) and the rest of the Forum. As ever, am happy to hear your comments. This entry was posted in playground, Public policy, Risk and tagged ASTM, Play Safety Forum, playground, playground safety, Risk, standard, USA. Bookmark the permalink. I could not agree more that the ASTM’s proposal needs additional research, consultation and rethink. In Canada we too seem to be dealing with the progressive play envoronment sterilization movement – and it is not only having no advantageous impact on injury – it is quite likely causing harm by decreasing interest in playgrounds, stunting movement skill and fitness development, and reducing habitual physical activity – all of which are associated with adverse long-term health outcomes and may also eventually increase risk of injury when faced with a challenging play task. Alex, Mark – thanks for the comments. Mark – absolutely: anyone looking at most North American playgrounds today can see that by and large sterility, dullness and lack of challenge are fitted as standard. It is no surprise that many are empty of older children or teenagers – or that older kids, desperately searching for some excitement, push the boundaries and/or abuse the equipment. In my view, the disproportionate focus on surfacing is a big factor in this trend. Time for a fundamental rethink, as you say. Good news…so far. What is George Sushinsky’s interest in pushing this through? Mick – George said in an email “Reballoting the proposed change allows this item to be resolved one way or another so that the subcommittee can focus on other issues that promote the safety of the play experience.” Of course, I and others think that the proposed change needs proper consideration and debate. I would encourage anyone who agrees with this view to make the point to George and ASTM. Have you got contact details for him/ASTM? Mick – I’ll email this to you. I was surprised to learn that you intend to re-ballot members following their decision to suspend publication of the safety surfacing proposals and refer the issue back to the committee. I gather that committee members took into consideration the widespread opposition from the play sector in the US and around the world and welcomed further debate. For you to pre-empt or indeed side-step this debate is deeply regrettable. I would welcome your rationale for this decision. I have worked in the children’s play sector since 1978 – see my website for my CV. I believe Mr. Shushinsky and ASTM International are due for an apology for some of the comments being made and/or implied. The following statement below in the next paragraph is true, to some extent, but to imply any underhanded non-transparent or flawed ASTM process could not be further from the truth. The voting process was overwhelmingly in favor of the change (9-1 of some 150 voting members). The negative votes, as few as there were, received proper review and rationale was given for ruling them non-persuasive. That vote was also overwhelmingly in favor the HIC reduction to 700 (8-2 – 2/3rds vote required to uphold action). The issue that ASTM debated and ruled on was not the merits of the change or the negative votes but the timeline in which supplemental information was distributed to all committee members. There were two papers which were sent to the Chair as some means of support of one of the negative votes to defeat the reduction of the HIC. These were sent out to all Subcommittee members electronically. Unfortunately the ballot was already out and some people had already voted. It was believed by the committee who was hearing the challenge to the ballot results that there should have been more time prior to the closing of the ballot or the ballot should have been delayed and re-balloted. The two papers that were submitted late were both presented and discussed and debated at the next ASTM meeting and they were determined to be of no consequence to the matter being balloted as they did not support either position for lowering or leaving the HIC at 1000. The issue was really an ASTM process issue. There was no issue with the subject matter being voted on one way or the other. So the outcome to delay action on the ballot results was never about the content of the issue but strictly the process. Therefore the issue to again go out to ballot is totally within Mr. Shushinsky’s authority as Chair of this Subcommittee. These comments are a result in the lack of knowledge and understanding of ASTM and the ASTM standards development process. ASTM, as an institution, does not provide technical data or research to support the rationale of their actions. The voluntary members of each Subcommittee provides the technical and subject matter experts which work on and develop the thousands of industry standards for materials and test methods. Mr. Shushinsky is a volunteer who Chairs the ASTM F8.63 Subcommittee responsible for the current ASTM F1292 Standard. He is charged with following the ASTM process throughout the standard development and subsequent voting process. There has been and will continue to be robust discussions and debate on all aspects of this and other ASTM Standards. The ASTM organization, its process, and membership rules are the most transparent of any standards development organization in the world. Where else can anyone become a member of such a Subcommittee charged with developing international voluntary industry standards for the small fee of 75 USD. Membership does not require attendance at each and every regularly held Subcommittee meetings but it does require each Subcommittee member’s ongoing participation in voting electronically on all Subcommittee Ballots. Each member receives electronic access to all Subcommittee meeting minutes, ballots including rationale for each ballot that is proposed, and other pertinent documents such as research papers related to the current topics being discussed by the Subcommittee. Unfortunately not every members takes the time to read through all the available documents in order to make an informed decision. I venture to say that each and every country represented in the most recent debate of the issue has a similar government mandate when it comes to the safety of children. Injury prevention continues to be the focus and the value of free play often suffers from the realities of our legal systems. This is obvious the case in the USA. Those of us who care deeply about the need for more risky play opportunities must not ignore the realities each public playground owner must face. The decision makers at these various governmental authorities, for the most part, are not well versed in all aspects of the long term care and feeding of a well thought out and properly executed public playground plan. Believe me what I say that each and every one of the concerns that have been voiced on this subject of lowering the current thresholds for surfacing performance within the equipment use zones has been raised over and over. Where has it got us to date? We continue to discuss and debate going round and round and make no real progress. Injuries continue at the same rate year after year. Playgrounds are neglected by those responsible for their day to day existence. Caregivers neglect their responsibilities to supervise those under their care and take full responsibility for their action rather than trying to place blame on someone else. 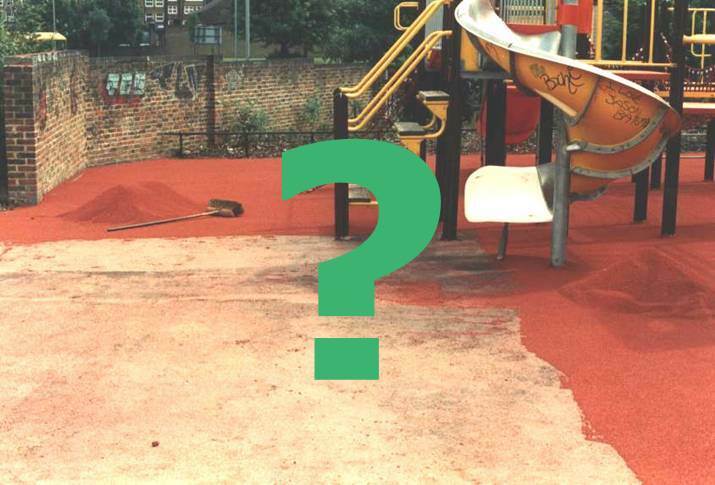 The premise by which we established the current thresholds for the performance of playground surfacing where children are likely to fall was based on the best information available in the early 1970s. Dare I say times have changed. There is much more medical and biomechanical research available today than when the ASTM and CPSC first looked at fall related injuries and injury prevention. We now have the ability, if we chose, to evaluate the performance of each and every playground surface in-the-field and not have to rely on some laboratory test that was done on some sample made especially for the laboratory test. How does that performance translate out in the field? We know there is a 15% probability of a life threatening head injury on the current surface systems which meet today’s standard. We also know that serious injuries do not all occur from a fall in which the user lands head first. Body blows can transfer enough trauma to create head injury. Our current standard was created to address serious head injury and not long bone fractures yet by most international health mandates for children’s injury prevention these long bone fractures can also be classified as serious to even severe and debilitating. We also know the frequency of fracture increase or decreases depending on how you wish to look at it from a G-max of 250 to 200 to 150 to 100. What is the magic number? I do not know but people much smarter than I have suggested that a G-max threshold of 100 would significantly reduce both the frequency and severity of fractures. A reduction of HIC to 700 from 1000 would in effect lower the G-max significantly and should therefore reduce long bone fractures. By how much only time will tell but doing nothing will only ensure that the frequency and severity of injuries will not diminish and the millions and billions of dollars public playground owners pay out for mainly long bone fractures will lead to viewer play opportunities as local governments remove playgrounds to avoid liability. The USA has its own challenges beyond just impact attenuation performance of playground surface systems. They have to address the minimum requirements of the Americans With Disabilities Law now know as the Department of Justice 2010 Standard for Accessible Design. It is the law of the land and this has been the most driving force behind the move to unitary rubber surface systems. This too has been a main concern in discussion about the apparent rise in long bone fracture, especially under and around upper body equipment, such as horizontal (hand over hand) ladders. While attempting to address accessibility with firm and stable unitary surfaces systems we negate the benefits of loose-fill surfaces that displace on impact either from vertical or lateral falls. I for one have been around this block too many times before over the past 10 years of open debate. I even attended on my own dime the October 2013 TÜV playground safety day 2013 in Vienna sponsored by TUV Austria Academy and ANEC in order to become better informed on the subject. It was widely attended and the topic of playground surfacing system performance was widely discussed. Attendees had very diverse backgrounds and represented many different EU member countries. There were even some representing the developmental benefit to children’s play and the need for graduated challenge for all. Everyone is entitled to their own opinion. I have formed my own opinion. My vote is based on information and facts that have been presented. Until someone can produce some solid information to demonstrate our current standard of 1000 HIC and 200g meets the scope of the standard I can only support the reduction of the current threshold that can be related to know injury reduction of the severity our current standard is suppose to address. If anyone wishes to attempt to change the current legal system in the USA be my guest. If anyone thinks they can get the US Consumer Product Safety Commission to change their definition of a serious injury, again be my guess. I am forced to live in the real world as imperfect as it may appear to some. Thank you Ken for taking the time to write what you did. What you wrote was professional; not personal; it was constructive and fact based. As committee members our core purpose of this group is the protection of children. We as members have invested time attending ASTM meetings twice a year and have assisted with developing the standards outside of those meetings. Some members are there to be constructive and some to be disruptive and disrespectful to those individuals that are trying their best. We are not all going to agree on the issues. We would be years ahead if so much time was not spent arguing at committee meetings and even blogs and other social media venues. Some of us do not pay our money and valuable time to go listen to the members fight, point fingers and call each other names because of different viewpoints. So often the meetings are like debate clubs and counterproductive. Again individuals may not agree with decisions that have or have not been made but there are ASTM standards for the reballot. Let’s move on and remember our core purposes is for the protection of our children. Ken and Denise – thanks for your comments, and for taking the time to engage on this issue. I am sure we all want the same thing: playgrounds in every school, park and neighbourhood that children can enjoy, and where they are not at serious risk of serious harm. As Prof David Ball’s recent discussion paper argues, there will always be some risk, no matter how impact absorbent we make the surface. At first sight, it seems obvious that making the surface more impact absorbent will help to reduce the risk of serious injuries, and hence that it is a good idea. But things are complicated (as you seem to agree Ken) for reasons that I outlined in my original joint letter with Robin Sutcliffe to ASTM. First, children may behave differently when they play with soft surfacing underneath, and this may reduce or even remove safety benefits. You only have to watch how children play in a bouncy castle to see that their behaviour can be dramatically influenced by what is beneath their feet. Automotive tests and the like cannot begin to take this into account. Second, some forms of surfacing may reduce the risk of some kinds of injury, but increase the risk of others. Technical and bioengineering studies may go some way to helping understand what might be going on. But real-world data is better. If we do not have the real-world data, should we not carry out the studies first? Third, changing this standard – unlike some others – raises important questions about social values and policies that need wider debate. In effect, tightening up surfacing standards is just as much a public health intervention as a product safety measure. Any reasonable taxpayer would expect answers to questions like ‘in the real world, how many injuries will this measure prevent?’ and ‘is this measure worth doing, bearing in mind what else we could spend the money on?’ Questions like these can only be answered by moving out of the realm of the technical and into a wider conversation with (for example) public health experts, decision-makers and the public. As the debate has unfolded a number of commentators have pointed out the potential for conflicts of interest. I do not want to get into a detailed debate about ASTM’s transparency or voting procedures. But ASTM needs to acknowledge that there are legitimate questions here, especially when the sums involved could run into the hundreds of millions of dollars, and where individuals and companies who might benefit are active on the relevant committee. To repeat: these are complex issues, and I make no apology for asking whether ASTM is addressing them properly. This means looking beyond technical and product safety expertise. It is not a criticism of ASTM’s committee to point this out. If, as you suggest Ken, the surfacing that has been installed in recent decades – at a global cost that must run into billions of dollars – has not had a big impact on injuries, then a pause and a proper review is even more urgent and important. You say that more research is needed, and that it should be multi-disciplinary, international and comprehensive, with careful thought given as to who should take the lead. I agree. And you worry that the industry has gone too far in its focus on injury reduction. Again, I agree. Tell me if I am wrong, but reading these articles of yours, it seems to me that when it comes to questions about ASTM and playground surfacing standards, your position and mine are not so far apart. Tim I absolutely agree with your reasoned comments. I would go further. If the US federal or state governments want to regulate and develop standards further that is a matter for them. But to try to export them to other countries that arguably have a better understanding of risk-benefit analysis is wrong. And I have to leave this quote from the above here: “ASTM, as an institution, does not provide technical data or research to support the rationale of their actions.” I rest my case.